Working in the motorcycle industry gives me an opportunity to make my daily bread surrounded by machines and people that bring me joy. My boss actually pays me to ride across country on a company bike and partake in the revelry of Sturgis! That’s a pretty good deal by my accounting. But sometimes the deal gets even better, sometimes quite unpredictably. On a warm and dry Wednesday morning at the Sturgis Dragway, S&S Cycle hosted an event in which individuals had an opportunity to ride their own machines wide open down the drag strip followed by a second pass on a Harley-Davidson® Dyna® model fitted with a fire breathing 124 cubic inch engine pushing 130 hp and 135 ft/lbs of torque. That day, nineteen riders shared in this experience and, by all accounts, were thrilled by the opportunity. Once all of the participants had moved along, something very special happened. One of those moments where a man can feel good about what he does, not because it brings him a tangible reward or compensation, but because his actions bring joy to others, unsolicited, unexpected. Dean Young, my friend and colleague who basically lives on the road promoting the S&S brand and representing the company at events, had arranged for one of our dealers, Harry Saunders from Shooters and Scooters in Troy, MT to participate in the event at the Dragway. Harry’s experience that day would not be of the standard variety, and in this most unexpected place, turned out to be something quite meaningful and gratifying. In the resplendent summer sun amidst the superficial attractions of Sturgis, we were going to send a one armed man down the track. Harry had lost his right arm in an unintended dynamite explosion while working as an excavator. He described being lifted 15 feet into the air and tossed 100, sure that his time on this earth would end that day. It didn’t though, and here he was, in the flesh and with most of his bones, ready to seize this moment in his life that he so very nearly lost. Don’t for a moment believe that Harry is a charity case or dependent on the goodwill of others. No, Harry rode his own specially modified bike to the track, we simply modified ours to make this occasion one in which he could partake. 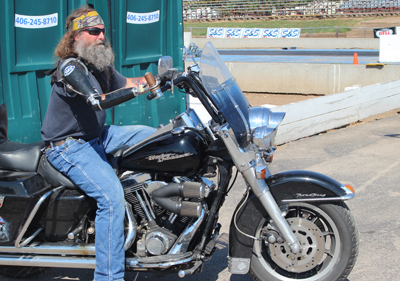 In the place of his right arm is a prosthesis that looks Terminator cool and is emblazoned with two stickers, one the Harley-Davidson® bar and shield, the other, the S&S banner. Harry has modified his handlebars to suit his needs. The throttle has been moved to the left grip, above it are two levers; a relatively small clutch lever that is actuated with the left index finger and a longer brake lever that is actuated with his other three digits. The right side of the bar is bare, save for a post approximately 1 ½” in diameter and maybe 4” tall that Harry can grasp with the hook of his prosthesis. He moves his bike along quite well, struggling only slightly to pull it around on tight right turns. Harry, Dean, and I removed the handlebars from our Dyna and replaced them with another set that Harry brought, strapped to the back of his bike. The bar was bare, save for the aforementioned post on the right handle. We then removed the controls and throttle cables from his bike and installed the assembly and bars onto the Dyna. Within a half hour, the conversion was complete and our friend was prepared to make his pass. It’s sometimes easy in the day-to-day load of work, family, and everyday struggles, to become dissatisfied or complacent. At times like this, a moment of introspection reminds us of how fortunate we really are; how on our worst days, we are still much better off than many people in this world. I couldn’t help but get a shiver up my spine and goose bumps down my arms as Harry slowly rolled the bike up to the timing tree at the home end of the drag strip. After some quick instruction, Harry pulled on his glove, nestled his safety glasses atop his nose, leaned forward into the bars and waited, just a brief moment, then fed the ground rattling 124” engine a fist full of gasoline and in an ear pounding blast, launched the bike down the strip. Harry returned to the starting line and repeated his trip down the strip probably a half dozen times, each time more comfortable with the machine, each time faster down the track. The smile on Harry’s face each time he returned told us that we had done well. Our seemingly very small gesture had created a moment hopefully very big in one man’s life.